IT IS A voyage explorers only dreamed of not so long ago. But thanks to climate change, a luxury cruise ship has undertaken a pioneering journey that will see it sail through the once impassable Northwest Passage during a month-long trip that is drawing much excitement but also criticism from environmentalists. The Crystal Serenity, which set off from Seward, Alaska on 16 August with nearly 1,000 passengers, is scheduled to dock in New York on 17 September. The ship made its last Alaska port call on Sunday, stopping in the remote town of Nome before heading farther north, accompanied by the RRS Ernest Shackleton, a British supply and ice-breaking vessel. The voyage marks the first time a passenger ship this size sails the storied Northwest Passage where warmer temperatures and melting ice are opening the Arctic — one of the most pristine places on Earth — for business. Passengers on board the €310 million vessel paid between €19,500 and €106,500 for the journey, which took three years of planning and preparation to avoid any mishaps, including a repeat of the Titanic. Guests were also required to purchase €44,500 in emergency evacuation insurance in order to cruise through the Northwest Passage — a once unnavigable shortcut between the Atlantic and Pacific oceans that is increasingly becoming a popular route for shipping. The Crystal Serenity reached the northwest territories on will and complete the Arctic leg of its journey by 4 September before heading to Greenland and finally New York. “Every aspect of this voyage is literally unparalleled in the luxury cruise industry, and nearly the entire travel industry as well,” Crystal’s CEO and president, Edie Rodriguez, said in a statement. It is a tremendous undertaking to embark on such a historic journey, but also an honor for us to be able to offer the world’s most discerning travelers the opportunity to experience a region of the world that so few others have or ever will. He said guests on the 250m, 13-deck vessel can enjoy a slew of activities, including helicopter flights over glaciers as well as polar bear and other wildlife sightings. Passengers also have at their disposal on board a fitness center, a spa, swimming pools, restaurants and luxury shops. But not everyone is hailing the high-profile voyage, with critics lashing out at Crystal Cruises and accusing the company of capitalising on the destruction of the planet. An article in the online current affairs magazine Slate offered a scathing review, describing the cruise as yet another example of a consumption-driven society that will stop at nothing. “It is a historic voyage, one that marks the opening of one of Earth’s last frontiers,” author Will Oremus wrote. It is also an abomination — a massive, diesel burning, waste-dumping, ice-destroying, golf-ball-smacking middle finger to what remains of the planet. 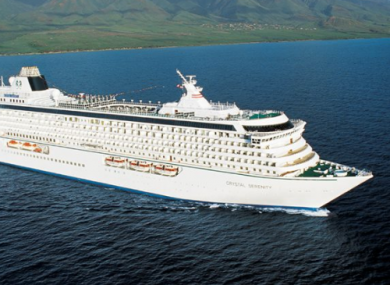 Elena Agarkova, senior program officer for the World Wildlife Fund, acknowledged that Crystal Cruises had taken measures to offset the environmental impact of the Serenity’s voyage, including not using heavy fuel oil and discharging waste water at least 12 nautical miles from shore. But she said there were still concerns about safety and protecting wildlife as well as the region’s diverse indigenous communities. “This voyage is symbolic of the rapid changes happening in the Arctic,” Agarkova told AFP. Today, we do not have the right rules in place needed to reduce risks to wildlife and people, nor the capacity needed to respond to accidents. She said that as climate change accelerates and Arctic shipping and leisure travel grows, governments individually and collectively must match that pace in managing the region. “Cruise ships of the size of the Crystal Serenity are essentially huge cities,” she noted. Agarkova said although the waste will be dumped away from shore, it will still be going into the Arctic ecosystem on a daily basis. “And of course the more ships that we have, the more impact and the more waste will be in these right now relatively pristine areas,” she said. I find it ironic that one of the biggest selling points of these voyages is to see Arctic wildlife and to see the last frontier. Email “This cruise ship is taking 1,000 super rich passengers on a controversial journey ”. Feedback on “This cruise ship is taking 1,000 super rich passengers on a controversial journey ”.